I have talked about one of Iran's mythical heroes, Kaveh the Blacksmith before. The mythical Kaveh is a blacksmith who challenges the demon King, Zahak, in his presence and in Zahak's imperial court and then leads the Iranian resistance against Zahak's tyranny. Yesterday news reached us of a new Kaveh who challenged the modern day Zahak, i.e the Supreme Leader, in the very midst of the demon's own den. Only this Kaveh is not a blacksmith, he does not seem to have the biceps we were used to seeing in the paintings of Kaveh in our text books, the new Kaveh is in fact a young Iranian computer programming genius, called Mahmood Vahidnia and a student at Sharif University who dared criticise the Supreme Leader face to face. It was supposed to be a typical Supreme Leader sermon, where the Supreme Leader ranted on and the audience sheepishly listened and followed. The audience on this occasion were Iran's gifted academic elite who have won honours and medals in international academic competitions. Mahmood Vahidnia however did not want to just sit there sheepishly and nod along with the others. After much waving of his hand and asking to be allowed to ask a question, the Supreme Leader himself pointed at him and asked him to come up. 'I have been reading the newspapers and magazines more seriously in the last five years, yet I have never seen any criticism of you. Those surrounding you have turned you into an idol." Vahidnia shocked the congregation. 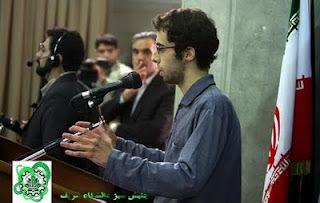 The Baseej students started protesting by shouting 'Finish him' and 'Time is up' but Vahidnia continued to lambast the state broadcasting by saying how can anyone think the state TV has accurately reflected the recent events of last months in Iran? 'Since you appoint the head of the state broadcasting either you are responsible for the biased coverage or you have lost all control of it' Vahidnia asked applying his computer programming logic. In repsonse, the Supreme Leader tried to distance himself from the State broadcasting by saying 'it is impossible for him to watch every program and approve of it but there is so much progress in the country that the state TV is not showing you youngsters.' He also denied that he does not welcome criticism and said on the contrary he welcomes it. Nevertheless the Supreme Leader was so visibly annoyed that he left the stage without leading the prayers which were supposed to take place at the end of the program. The encounter was reported on the Supreme Leader's own website. Can we find video of this? This modern day Kaveh embodies the very best of what it means to be Iranian. This is what we call speaking truth to power. sooo... you don't think it was set up if it's being reported on khamenei's website? I have my doubts... but ultimately I think it was spontaneous because how could they now the consequences of such a setup? Will it embolden the people, or will it pacify them that the "supreme leader" is being criticized directly? I dunno though, coulda been a setup. I spoke to a few people before publishing this. Apparently the Supreme Leader's website was not the first one to report this, it was Peiknet. Once the rumour started spreading the Supreme Leader's site then published it, after all more than a 1000 people there were present and the gossip had spread. Also I was told, what the student said were sound points, so what could the set up have been? There were some inaccuracies that had crept in the reports such as the student had won the Maths Olympiad Gold Medal last year, which I checked and was not true. He was however part of a school team that took part in a computer programming competition. Still who knows they could put him in a hole and put pressure on him and in two weeks time show him on TV saying how much he loves the Supreme Leader and Tritta Parsi and you, who knows. Get 10 more books out of the library and lets see if you have been as wrong has you have been on just about everything in the past. Ah, forget it. I'll just go to the next peaceful academic forum and disrupt it basiji style. "Have you been to Evin! I've been to Evin! woof woof, bark bark." Will I be able to put this "life experience" on my resume? p.s. Btw, I agreed that this was spontaneous you "cyber tart," I just had my doubts. A true Iranian lion. Thanks for this. Why would it be faked? What incentive would they have to put the aging, dying, "Supreme Jurisconsult" through this awkward moment? If he was a plant, why would they kidnap him afterwards. ...non ho parole..!! !..gran fegato, questo ragazzo..Merita tutta la mia solidarietà.. Il Futuro è in mano ai Giovani.. prendiamo esempio da questo GRANDE EROE.٩(-̮̮̃-̃)۶.,•♪♫♪♥. Mi auguro solo che non diventi vittima di quell'ODIOSO Dittatore.. ciao TanjaG. the criticism were so bold and striking that i doubt it was staged. The result seems to be embarrassing for the regime so i doubt it was pre-planned. I am a tad skeptical about this one. It seems regime made up this story to dismiss the rumors that Khamenei is in good health.